Beck and Baird was responsible for site layout, siting of twenty one initial buildings, parking design for over 3000 spaces, and extensive outdoor pedestrian circulation and recreational facilities. Developed large surface reservoir to maximize storage and use for irrigation water rights. Design elements included preservation of existing grove of trees, design of a water feature off entry plaza and perimeter walking path for office staff. Olsen and Associates of Nampa, contracted Beck & Baird to provide them with a landscape master plan and landscape design guidelines to guide development in the future. Beck and Baird met with separate groups involved in the NNC campus, including; staff and faculty, students, alumni, the Nampa community members, and the NNC Foundation in order to get input and develop the plans and guidelines. With the reroute of two key through streets, and the acquisition of a neighboring park, NNC was at a unique time it its life. For the first time in its history, NNC has a contiguous campus and the opportunity to create a campus that befits it’s nationally acclaimed status. Beck and Baird was retained to master plan the Hewlett Packard campus in Boise Idaho from initial concept thru completion of Building Seven. 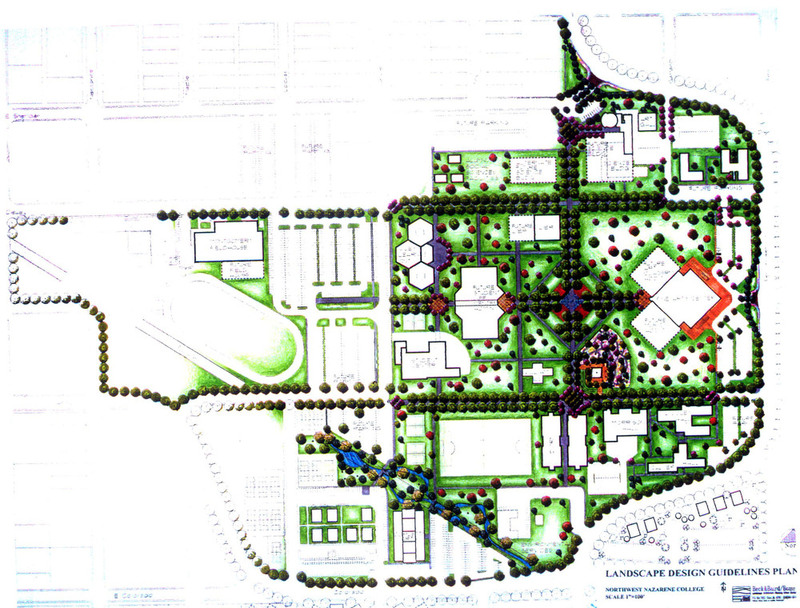 Beck and Baird was responsible for site layout, siting of seven primary buildings, parking design, outdoor pedestrian circulation and outdoor plaza development, recreational facilities, and extensive landscaping.